Barnet Council’s Leader has responded to the announcement that Barnet is set to become London’s most populous borough. The figures, released by the Mayor of London, confirms that the capital is set to be home to more than 8.6 million people, higher than any point in history. Barnet is set to overtake Croydon to become the city’s most populous borough in the coming months with 393,000 residents, compared with Croydon’s 381,000. Councillor Richard Cornelius, Leader of Barnet Council, said: “Obviously there is an element of pride and challenge in becoming London’s most populous borough. “Pride, because it demonstrates what our current residents already know, that this is a great place to live with lots of green space, good schools and excellent transport links. Challenge, because we need to make sure that we are providing the necessary infrastructure, schools, and health centres for this growing population. “We need to work closely with the Mayor to make sure our transport infrastructure can cope with the numbers. We have a really good record on delivering on school places and have recently completed building two new schools in the last year. This news has not come as a shock to us, the borough has been steadily growing and we have been preparing for this for years. Government money needs to be allocated to where people live rather than the areas they have come from. • Based on the GLA’s projections, there are projected to be 393,000 people living in Barnet by the end of 2015, making it the most populous borough in London. In 2011 there were 356,000 people living in Barnet. • The age groups that are projected to grow the most are the older and younger groups. For example the 65+ population will see a 48% increase during the period 2011–2031, and the 0-15 age group will see an increase of 14% increase between 2011 and 2031. • The bulk of growth is projected to take place in the West of the Borough, driven by developments like the Brent Cross Cricklewood regeneration scheme. Colindale and Golders Green wards are projected to show the greatest increase in total population. Between 2014 and 2021, Colindale is projected to increase by over 50%; while Golders Green is projected to grow by almost 30%. * Up to 2016/17 the council is investing £140 million in creating around 4,500 new school places up to 2016/17. 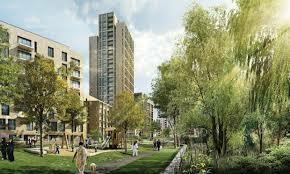 • Barnet is currently regenerating its four largest estates and developing the three strategic growth areas identified in the London Mayor’s Plan – the Cricklewood, Brent Cross and West Hendon regeneration area, Colindale and Mill Hill East. • Current projects include; 15,000 new homes to be built on the borough’s regeneration estates, 10 new schools are being built across primary, secondary and higher education levels.